In Hong Kong, Edwina Tops-Alexander will be close to her native Australia. Will this proximity inspire her to win a second consecutive victory in Season IV from the series of the Longines Masters? Hong Kong, January 29, 2019 - In Hong Kong, Edwina Tops-Alexander will be close to her native Australia. Will this proximity inspire her to win a second consecutive victory in Season IV from the series of the Longines Masters? The rider obviously dreams of making history with this series and the Grand Slam indoor of Showjumping. But the task will not be easy because AsiaWorld-Expo will host an exceptional line-up this year! The Australian will not be the only former winner of the twenty Longines Grand Prix that have been held at the Masters since 2010: Olympic champion Kevin Staut (2013 in Paris, where he also won the Longines Speed Challenge last December) and 2014 World Vice Champion Patrice Delaveau (three wins, including two in Hong Kong, where he is the current title holder) come back to this Asian leg of the Series with big ambitions. In fact, Hong Kong is a bit like a private garden for Patrice Delaveau, who won in 2013 four of the five events he competed in, placing second in the fifth and being the only rider to have won the Longines Grand Prix twice in the same place, a rare achievement in the history of this sport. Third in Paris, Irishman Denis Lynch will be in Hong Kong with his compatriot, the young Bertram Allen (24 years old) who won the Longines Speed Challenge in 2016. Along with Kevin Staut, two other former world No. 1s will also be in Hong Kong: Switzerland’s Pius Schwizer, who made a remarkable comeback at the highest level (second place last Sunday at the Longines World Cup Grand Prix in Amsterdam) and France’s Simon Delestre, also a former World Champion runner-up. Dutchman Gerco Schröder, 2014 World Champion and 2012 Olympic runner-up, will also be present. Belgian François Mathy Jr. is also in good shape at the moment: he just finished second at the Longines World Cup Grand Prix in Leipzig and will be in Hong Kong with his compatriots Olivier Philippaerts, Jérôme Guery and the youngsters Maxime Harmegnies and Pieter Clemens. Even the continent of Africa will be represented, by a rider who particularly shone in 2018 when winning the prestigious 5* Grand Prix of Paris-Eiffel and Calgary: the Egyptian Sameh El Dahan. With the HKJC and the HKEF, this year EEM honors the riders of the Asian region on the way to Tokyo 2020. Of course, for the fourth time Jacqueline Lai, one of Hong Kong’s most experienced riders, individual silver medallist at the China National Games in 2013 will be present. 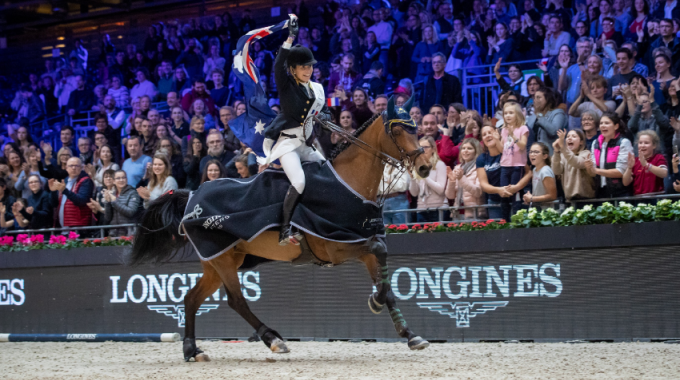 It will also be an opportunity for the public to discover Raena Leung, also a local rider who, after spending several months competing in Europe, will return to Hong Kong to perform on her own ground. And these Hong Kong women won’t be the only Asians to compete in «their» Longines Masters, as Japan will also be represented by Hikari Yoshizawa, China by You Zhang, Ella Wang and Zhang Xingji, Korea by Manjun Kwon, and Taiwan by Isheau Wong. With the Asian richness of this line-up, EEM follows its ambition initiated in 2013 to develop the equestrian sector and boost top-level sport in Asia.